Cats need to have physical exercise, but they also need something to mentally stimulate them before they will engage in activity. This may be why we notice our indoor felines becoming more sedentary. And with inactivity, of course, comes the extra weight, which brings its own set of problems. However, you don't have to spend a fortune on cat toys to get kitty interested in play again. You actually have everything you need at your fingertips with these websites for cats to watch. Sounds, nature, action...oh my! These videos are sure to get your feline up and movin'. Ladybugs, ladybugs and more ladybugs is what awaits your feline friend on the Catching Ladybugs website. It features these realistic looking insects on a green background that really makes them pop. The video starts with one ladybug scurrying around the screen, then it adds more and more to amp up the fun. The insect noises in the background add a realistic touch to the whole video. Your cat can enjoy swatting at these bugs for an entire 20 minutes, while his little brain tries to figure out how to actually capture them. Watch the Catching Ladybugs video below! With 2 hours of birds flying, eating and singing, your pet will think he's really outside. This website for cats focuses on many different types of birds in different situations like geese flying over a pond, closeup of a cardinal eating and flocks of birds doing what they do. This video is taken with real footage, so it's as realistic as you can get, without your cat actually going outdoors. Watch the Bird Movie for Cats! Have your sound turned up for this cat movie, as it starts out by getting your feline's attention with a kitten loudly mewing and a can of cat food being opened and served up. Once your cat is engaged in the opening action, it goes on to show all things a cat would like. This includes butterflies, budgies, rodents and more. Their use of household items like the swinging blind cords and cat toys is something most cats can relate to which will, in-turn, help keep their attention. The tropical fish are cool, too! Watch the Cat Video Mix! Although, this website for cats only lasts just over 3 minutes, it will capture your cat's attention for those few moments. It uses real cat meows to get your feline to focus on the screen. Then the fun part begins; a cartoon mouse scampers quickly across, down and around the screen. The different speeds and directions the mice present will keep your cat guessing as to where they will appear next. Watch the Cat Games - Mouse Hunt! Cat Movie in "Cat Vision"
The makers of this cat website have used colors that your feline is (apparently) able to see better than just a normal video. The background is a deeper blue, with a purple cartoon mouse darting this-way and that-way. Its duration is just over 2 minutes, but the speed of the mouse does entice cats to swat at it. Watch the Cat Movie in Cat Vision! It's no secret that cats love strings. But what if you don't want to clean up the mess a ball of yarn will present? Then try out this cat website. String String Things uses funky music and a red string "slithering" throughout the screen. The speed of the string fluctuates from super-fast to more methodical and the realistic cat call will definitely get (and keep) your cat's attention. Does your cat like to watch fish? You may not know until you pop on this 3 hour website for cats. The fish have been videod swimming in a close-up fashion, with the sound of splashing water in the background. The fish are big enough for your cat to really see and want to swat at. In fact, if this website is on a big screen, these fish are going to look more shark-like than tropical in-nature. The Friskies cat food company has put together a whole website full of downloadable games for your feline friend. It includes the Pull n' Wobble, the Cat Fishing and the Jitterbug. These games are perfect for tablets and will engage your cat in both physical and mental stimulation. Plus, no pop-ups to interfere in the movement and images. Download Friskies Games for Cats! Websites for Cats for Hours of Fun! Providing your feline friend with some mental and physical stimulation is one of the best things you can do for her. This not only challenges your cat's brain, but it breaks up the monotony of an otherwise boring day. Plop you cat in front of the screen with any of these websites and watch the fun begin. Just be sure your tablet/screen can take kitty's claws in case the chase gets "heated." And always remember to reward your cat with a treat when the "hunting" is done to avoid her from getting too frustrated. Here's another video of Milo catching mice! catcatcat.com is a participant in the Amazon Services LLC Associates Program, an affiliate advertising program designed to provide a means for sites to earn advertising fees by advertising and linking from “Cat Cat Cat” to Amazon (amazon.com, or endless.com, MYHABIT.com, SmallParts.com, or AmazonWireless.com). 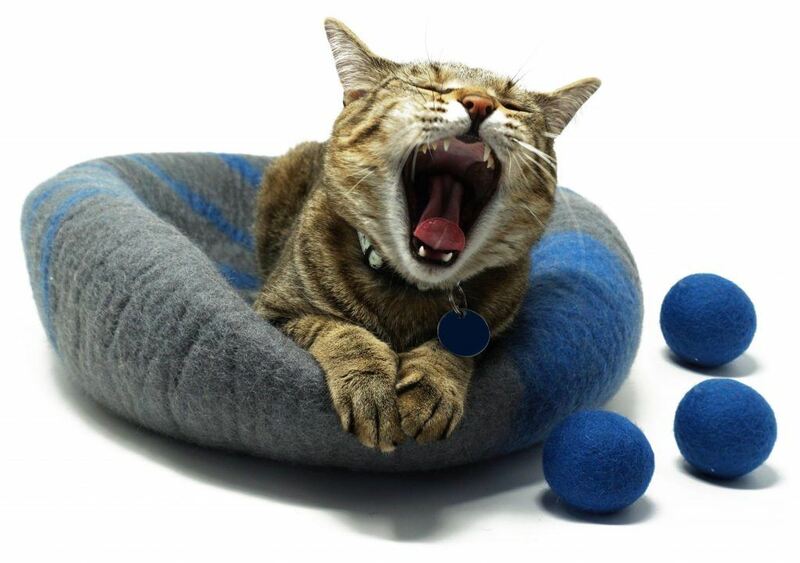 Luxury Cat Toys – The Best of the Best! 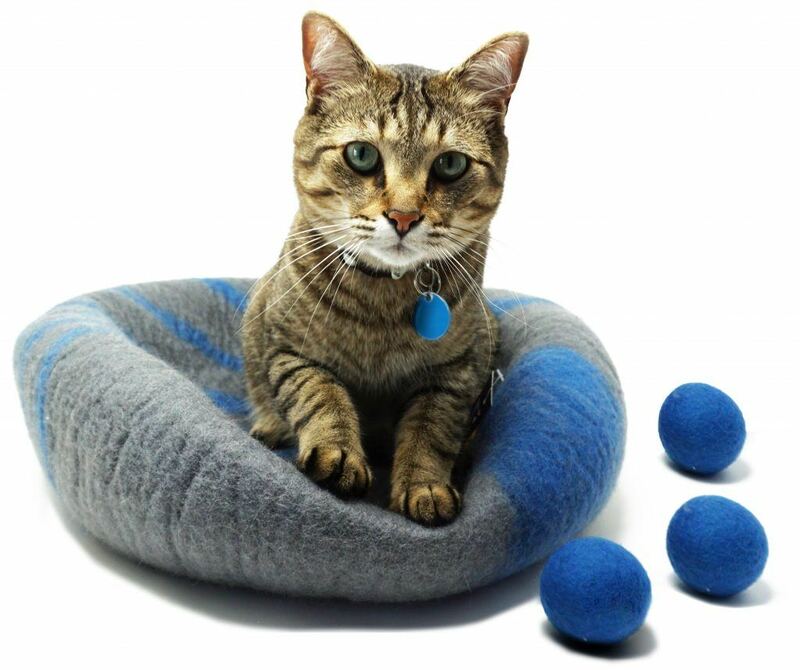 The Ultimate Large Cat Toys Every Kitty Needs! Copyright 2019 by CatCatCat & FrugalHackMe, LLC. We Just Launched Our New Cat Caves! Get Yours Today For Only $44.99! 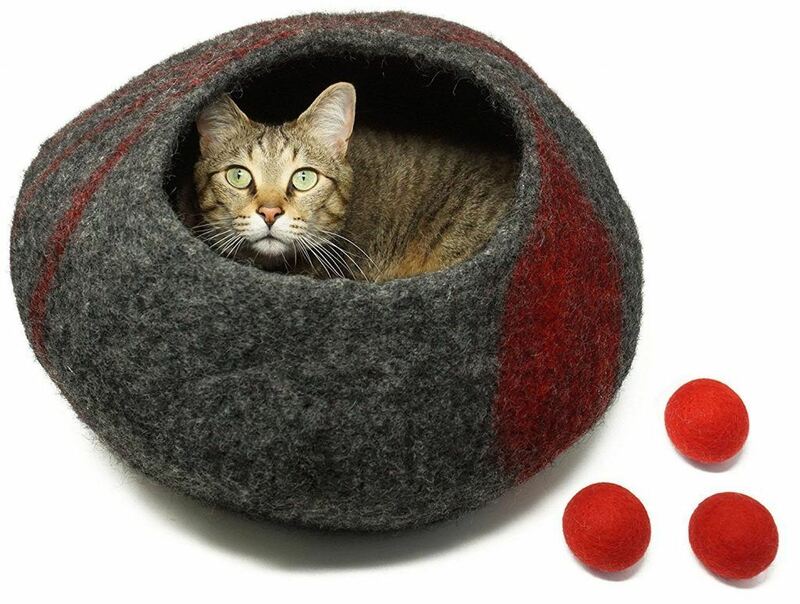 Made out of 100% Merino wool, includes 3 FREE wool balls, and cats love them! 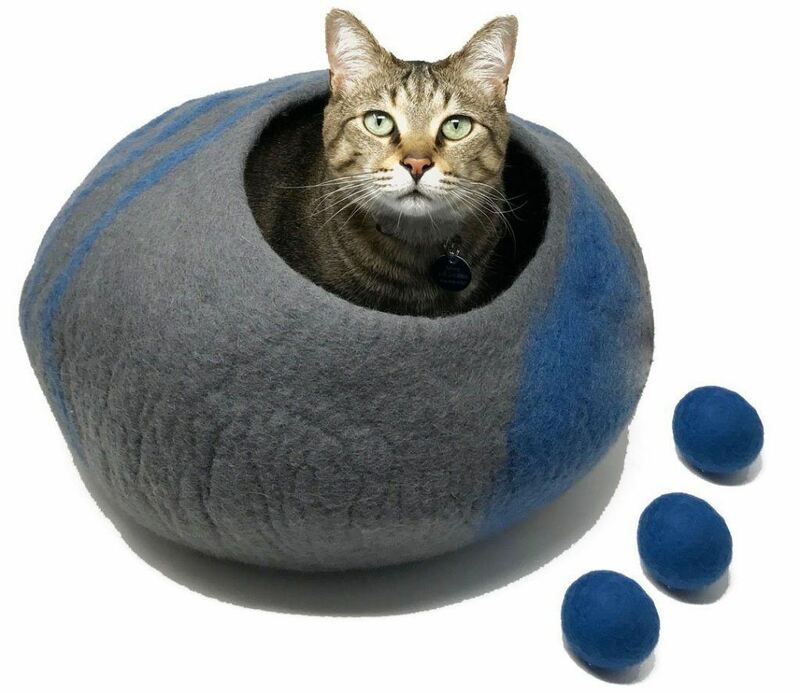 Get your CatCatCat cave today on Amazon!